Ethereum has multiple options for clients that you can run in order to have your wallet and operate with Ether (ETH) coins as well as to have access to the network. This allows users to choose what client works best for them and what they prefer to stick with and can also help with issues like with the fork of the network earlier today. There was a consensus issue that occurred on the Frontier network at block 116522, mined on 2015-08-20 at 14:59:16+02:00 that has affected geth implementations up to and including versions 1.0.1, 1.1.0 and develop (“unstable 1.1.0”), while eth (C++) and pyethereum (Python) were unaffected. There was a fix released for the affected Ethereum clients released shortly after and users are required to update their geth client (source) if they are running it . Since geth is our preferred Ethereum client software and we have been using it for our guides as well, if you also rely on geth you should update it with the fixed version of geth 1.0.2. 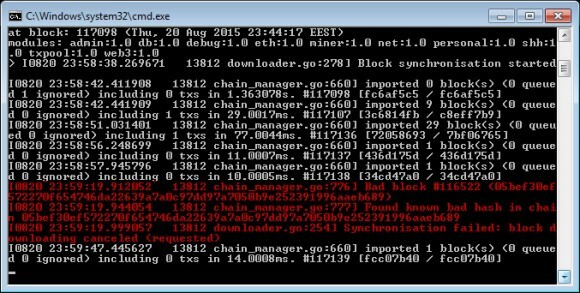 We have provided a fixed Windows binary in our mining package below that you can download and update on your system. All you have to do is to stop the old client, replace the old geth.exe with the new one provided and run the new geth client software and you should be just fine. After the update it is Ok for you to see an error message like the one marked in red on the screenshot above, this is normal and the error message should disappear after a while when all clients update to fixed version of geth. You are seeing the error message as you are getting connected to a peer with an older version of geth, so once there are no more peers with the older non fixed version the message alert which will resolve itself. Exchanges and pools should update very soon if they have not yet updated to the fixed clients and should resume their normal operation, though there could be some delays in transactions and some issues with transactions sent during the problem with the network.